We receive many questions about SMART-1 and its mission to the Moon. Before posting your question, please go through the following FAQs to see if your question has already been answered. Where does the name ‘SMART-1’ come from? The acronym SMART stands for 'Small Missions for Advanced Research in Technology'. This is a series of small, relatively low-cost ESA missions to test new technologies that could be used on bigger projects. What are the scientific mission objectives and what are the technological ones? SMART-1 will test key technologies while performing an unprecedented scientific study of the Moon. Its scientific goals are to: search for signs of water-ice in craters near the Moon’s poles; contribute data to clarify the (still uncertain) origin of the Moon; reconstruct the evolution of the Moon, by mapping the surface distribution of minerals, its key chemical elements and topography. SMART-1 data could also be useful when selecting sites for future landing and Moon exploration. a navigation system that, in the future, will allow spacecraft to autonomously navigate through the Solar System; and a space-communication technique based on laser beams, in addition to a new short wavelength communication system. It is the first European mission to the Moon. It will perform one of the most comprehensive 'global' explorations of the Moon so far, using state-of-the-art instrumentation, and will therefore gather data to answer long-standing scientific questions. It is a step towards more ambitious, future space exploration. Future space missions will rely on the technologies tested with SMART-1. It has been built very quickly (in less than four years) and for about one-fifth of the cost of a major science mission for ESA. Why does SMART-1 represent a breakthrough in planetary exploration? SMART-1 is the first European spacecraft to use an ion engine as a main propulsion system, however it introduces an additional challenge - to go to Moon, the spacecraft combines for the first time ever solar-electric propulsion with manoeuvres using the gravity of celestial bodies. Engineers will therefore have to consider the gravity of Earth and the Moon at each stage of the journey, and adjust accordingly the thrust provided by the ion engine. These kinds of manoeuvres have never been done before; experts developed new mathematical optimisation techniques specifically to exploit them. Solar-electric propulsion, one of the main technologies to be tested in SMART-1, is a new propulsion technique that uses so-called 'ion engines'. Ion engines work by expelling a continuous beam of charged particles, or ions, which produces a thrust in the opposite direction and therefore pushes forward the spacecraft. The energy to feed the engine comes from the solar panels, hence the name 'solar-electric propulsion'. Hasn’t this type of engine been used before? This propulsion system has been used as a main propulsion system only once before, in NASA's demonstration spacecraft Deep Space 1, launched in 1998. Engineers from around the world have been working on ion engines for decades, but only recently have obstacles such as the lack of power availability from spacecraft’s solar panels been overcome. Several recent missions have used ion thrusters, mainly for attitude control and orbit station keeping. In the recent case of ESA’s telecommunication satellite Artemis, the on-board availability of ion thrusters even allowed the mission to be rescued. After having been left by the launcher on an unplanned orbit, Artemis could be slowly - but safely - brought up to its final working orbit thanks to the power of ion engines, initially designed for orbit maintenance only. What are ion engines? How do they work? Ion engines work by expelling a continuous beam of charged particles, which pushes the spacecraft forward. The energy to feed the engine comes from the solar panels, thereby the name 'solar-electric propulsion'. These engines generate a very gentle thrust that makes the spacecraft move relatively slowly: SMART-1 will be accelerated just 0.2 millimetres per square second, with a push equivalent to the weight of a postcard. What are the advantages of ion engines? Ion engines are very efficient: they deliver about ten times as much ‘impulse’ per kilogram of propellant used. This allows a substantial reduction of the mass of the fuel carried on the spacecraft, which in turn leaves more room — more weight — for scientific instrumentation. Also, ion engines allow designing trajectories to travel very long distances in less time, thereby opening the door to a deeper space exploration. Another advantage is that these engines allow very accurate spacecraft control, which is essential for missions that require highly precise target pointing. Can ion engines be used to take off from Earth? No. Ion engines generate a very gentle thrust. SMART-1 will be accelerated just 0.2 millimetres per second per second, with a push equivalent to the weight of a postcard. This is why solar-electric propulsion cannot be used for taking off from Earth - it only works in the vacuum of space. However, once launched, and compared to conventional chemical rockets, which burn for a few minutes, ion engines work for years, or for as long as the solar panels keep providing electricity. Therefore the ion ‘tortoise’ will eventually overtake the chemical ‘hare’. Why is SMART-1 testing its ion engine on a trip to the Moon? First, the Moon is a very interesting scientific target! Secondly, SMART-1 could share the cost of the Ariane-5 launcher with other passengers also going up to the geo-transfer orbit (GTO), from which the Moon can be reached. Last but not least , the necessary spiral orbit which SMART-1 took to reach the Moon from the GTO, is a long and complex trajectory: this allowed SMART-1 to test fully and properly the ion engine in conditions representative of a fully fledged deep-space mission. Are there future missions that will use ion engines? ESA forecasts several (scientific) missions that will use ion engines: BepiColombo (to Mercury); Solar Orbiter (to the Sun), and LISA (to detect gravitational waves). However, these missions still have to be confirmed by the Science Programme Committee. Why is it relevant for Europe to go to the Moon? Europe is going to the Moon because our knowledge of it is still fairly incomplete. The scientific data that SMART-1 will gather are important not only to European scientists, but to the worldwide scientific community. There could be information about the existence of water and other resources on the Moon (oxygen, valuable minerals, and so on). Such information would be very useful when the time comes to consider a long-lasting human presence on the Moon. Europe should not lag behind in such plans. What kind of journey will SMART-1 make? SMART-1’s journey to the Moon was neither quick nor direct. After launch, SMART-1 went into an elliptical orbit around the Earth. Then the spacecraft fired its ion engine, gradually expanding its elliptical orbit and spiralling out in the direction of the Moon’s orbital plane. Month after month, this brought SMART-1 closer to the Moon, (orbiting between 350 000 and 400 000 kilometres from Earth). As SMART-1 neared the Moon, it began using the gravity of the Moon to nudge it into a position where it could be captured by the Moon’s gravitational field. After being captured by the Moon, SMART-1 started to loop over the north and south poles, in an elliptical orbit whose height ranges from 300 to 10 000 kilometres. During its scientific mission, if the remaining fuel permits, it will use the ion engine to gradually lower its highest altitude. How long did SMART-1 take to get to the Moon? How many kilometres did it travel? SMART-1’s purpose is to test ion propulsion rather than to get to the Moon quickly. It will took 16 months due to its new propulsion technique. In a straight line, the distance to the Moon would have been between 350 000 and 400 000 kilometres. However, SMART-1 travelled about 100 million kilometres to reach its destination. Previous missions, such as NASA's Apollo flights, took about four days to get to the Moon. Was there a special reason why there were two other satellites on board the Ariane-5? What determined the launch date? SMART-1 is a small satellite. It weighs 366 kilograms and roughly fits into a cube just 1 metre across, excluding the 14-metre solar panels (which were folded during the launch). For this reason, SMART-1 could 'share' the launcher with another two spacecraft. This also lowered the launch costs considerably. The launch date and time was mainly determined by the launch requirements of the two other spacecraft. What were the crucial moments for SMART-1 during its journey and arrival at the Moon? The Ariane-5 launcher put SMART-1 into an elliptical orbit around Earth. Then, in the first part of the mission, SMART-1 ‘fired’ the ion engine continuously to gradually expand its path into a spiral until its perigee was outside the radiation belts. (It did this to keep the degrading influence of the radiation on the solar panels to a minimum). Later the burn strategy became more sophisticated - designed to minimise the fuel consumption. At 200 000 kilometres from Earth, the spacecraft began to experience significant gravitational tugs from the Moon as it passed by. Once SMART-1 passed within 60 000 kilometres of the Moon, this body's gravity was much more pronounced, in encounters known as ‘lunar swing-bys’. At about that distance from the Moon, SMART-1 passed through an invisible doorway in space called Lagrange Point Number 1, or L1 for short. This stage of the trip was called 'lunar capture'. The gravitational effects of the Moon and Earth are in balance at L1. Beyond this point, SMART-1 flew over the lunar north pole, aiming at a point of closest approach above the south pole, so achieving a wide polar orbit around the Moon. During the weeks that followed its capture by the Moon, SMART-1’s ion engine gradually reduced the size and duration of this orbit, to improve the view of the lunar surface. Did SMART-1 do anything of interest during the trip? Tested a navigation system that, in the future, will allow spacecraft to autonomously determine its position and navigate through the Solar System. Constantly monitored the performance of the ion engine. SMART-1 tested an on-board computer system for autonomous navigation. Does it mean that after SMART-1, spacecraft will be able to navigate really autonomously, without ground control? A new experiment called ‘OBAN’ (On-Board Autonomous Navigation) is being tested on SMART-1. It will allow the spacecraft to determine its precise location in space on its own, without being tracked by ground stations. It is a very important step towards a new generation of self-controlled spacecraft. Once the experiment is successfully completed, OBAN may well allow spacecraft travelling all over the Solar System to set their own courses. Which places on the Moon will SMART-1 explore? SMART-1 will orbit over the north and south lunar poles (‘polar orbit’), so it will be able to observe the whole Moon (including its less-known far side). The poles, especially the south pole, will be particularly interesting, since they are fairly unexplored. Moreover, some features in the polar regions have a geological history different from the better-studied equatorial regions (where all landers have landed so far). Haven’t enough missions already gone to the Moon (or will go there)? Despite the number of spacecraft that have visited the Moon, many scientific questions about our natural satellite remain unanswered. 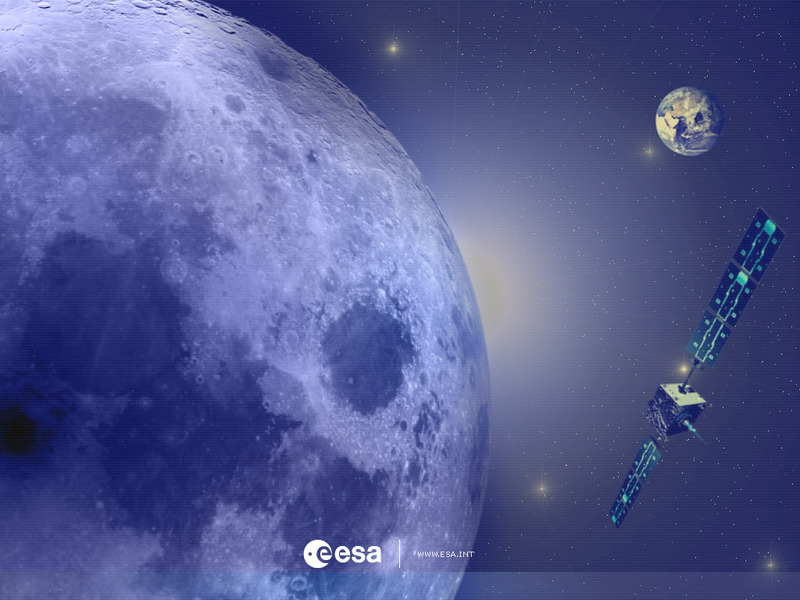 Europe plays an active role in the international lunar exploration programme and is offering an important contribution with the data SMART-1 will gather. There are completely new instruments, such as X-ray and infrared spectrometers, on board the spacecraft that will help study the Moon. Such instruments have never been used close to the Moon before. Will SMART-1 be able to see evidence of NASA’s Apollo moonlandings? Despite the fact that SMART-1 will cover virtually the whole Moon with observations by with several instruments, unfortunately we will not be able to image the Apollo landing sites with enough resolution to detect the presence of any remains from the Apollo missions. A resolution of about 1 metre would be necessary for that. We have a camera with a resolution of 0.005176°, which translates into a resolution of about 90 metres from an altitude of around 1000 kilometres. In order to image the Apollo remains with our camera, we would then need to fly at an altitude of about 11 kilometres. This is due to the fact that the optics of our camera were designed for the specific scientific needs of this mission. We could have easily designed an optical system with a narrower field of view and capable of detecting the Apollo remains, but alas this was not a mission goal. What happens to SMART-1 once the mission is over? The amount of fuel consumed determines the final orbit around the Moon. If a lot of the fuel is already consumed during the trip, the orbit around the Moon will be very elongated. This orbit will only 'survive' for six months and then SMART-1 will 'fall' on the Moon. If the fuel consumption during the transfer is less, SMART-1 may have a more stable Moon orbit that could last for centuries. In this case, we will either switch off the spacecraft and leave it orbiting or, if fuel allows, make it descend closer to obtain higher-resolution observations. Will SMART-1 data be available to the scientific community worldwide or will there be restrictions on the data distribution? If so, why? SMART-1 data will be available to the whole scientific community. The teams building SMART-1 instruments have the right to work with the data exclusively for six months. After that, the data become public domain. This is standard for space science missions. Will SMART-1 return images of the Moon? Will they be available in real-time? To whom will they be forwarded and who will exploit them? Will there images from the Moon also accessible for the general public? SMART-1 will produce high-quality images, which will be also made available to the public after the necessary processing. The AMIE instrument will deliver images from Earth and the Moon for several public outreach and educational projects. 'Real-time' images will not be available. Will SMART-1 be collaborating with other missions to the Moon? What is its role in the lunar exploration programme? SMART-1 is part of the International Lunar Exploration Working Group (ILEWG). This group unites ESA, ISAS and NASDA (both Japan), NASA and several other space agencies around the world. ILEWG aims to pool results from all recent and future spacecraft, in integrated data sets. Interpretations of lunar geology and history will be aided by Japan’s Lunar-A spacecraft, launched in 2004. Pooling results, including those of SMART 1, will enhance the scientific value of all these missions. Which countries contributed to building SMART-1? The industrial prime contractor was the Swedish Space Corporation (SSC) through its Science Systems Division. About 20 subcontractors and suppliers from six European countries were involved in building the spacecraft. For the science and technology payload, coinvestigators came from nine European countries, ESA, and from the United States. Will there be other SMART missions in the future? 'LISA Pathfinder' (formerly called 'SMART-2') is already in preparation. This is a mission designed to test key technologies for a future ESA mission called LISA (Laser Interferometer Space Antenna) which aims to detect so-called gravitational waves, the 'ripples' that propagate through space-time when massive objects, such as black holes, are accelerated. How much does the mission cost? In total, SMART-1 will cost approximately 110 million Euros, about one-fifth of the cost of a major science mission for ESA. That includes the launch, the operations and a dozen scientific experiments.. That was achieved partly by using new management methods — such as working with smaller teams both within ESA and in the industry — and partly because of some of the new features inherent to SMART-1, for example the miniaturisation and novel design. Is there new technology that has been developed for SMART-1? SMART-1 is a technology mission. Engineers have developed several new technologies for SMART-1 some of which will be tested on board SMART-1. These include ion engines which constitute the essence of the mission. The avionics architecture based on a newly developed data bus and the most powerful computer ever used on an ESA mission are new as well. The power subsystem is also based on new technology, like the very compact power regulators and battery cells and electronics. Thanks to the new miniaturisation techniques used, SMART-1's payload (a dozen technological and scientific investigations) weighs only 19 kilograms. One of SMART-1's experiments is OBAN, which tests a new navigation system paving the way for future spacecraft that will be able to navigate on their own, without ground control. Apart from that, SMART-1 used for the first time mathematical techniques developed to combine the thrust of the ion engines and the gravity of celestial bodies. Is this technology likely to be reused? Are their any immediate spin-offs that are making the investment more worthwhile? Absolutely, but most of the spin-offs are for other (future) space missions: if the new technologies being tested on SMART-1 work, they will be reused. That is the whole reason for launching SMART-1! Concerning the spin-offs for Earth applications, it is difficult to predict. However, experience has shown that spin-offs are rarely planned, but arrive when technology is pushed to its limits. This is the case with SMART-1! Is NASA involved in SMART-1? No, but there are co-investigators from the United States involved in SMART-1, mainly in the radio science experiment. Do you think it will be feasible to send people to the Moon to live there in the short term? Maybe not in the short term, but to many scientists and engineers the Moon is the best place to test human ability to survive in a non-Earth environment. Current science and technology missions to the Moon, such as SMART-1, will deliver valuable data for the future human exploration of the Solar System. I have a question that is not answered in this FAQ list. What should I do? You can send your request here. Given the huge volume of questions we get every day, we cannot guarantee to answer every e-mail individually. If it's a question we've seen before, we'll consider adding it to our current FAQs list.